Blue Pepper Press, 9780983042815, 358pp. When a billion-dollar electric car startup crashed and burned, global investors and average car buyers alike asked: What happened? 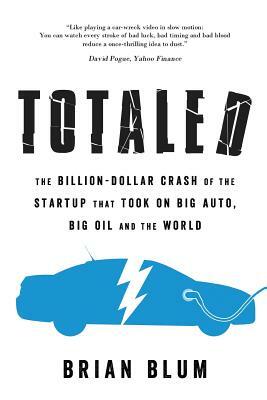 Business and technology journalist Brian Blum reveals the answer in his new book TOTALED: The Billion-Dollar Crash of the Startup that Took on Big Auto, Big Oil, and the World. The Tesla 3 has grabbed the spotlight as the first "affordable" all-electric vehicle, but Israel's Better Place came first. The plan was to use Israel --- a country the size of New Jersey and dubbed "the Startup Nation" --- to prove electric cars could work everywhere. Instead of fast charge, Better Place addressed range anxiety by building a network of battery-swap stations --- operated by robots. Better Place's charismatic CEO Shai Agassi believed his company's innovative technology could help stop climate change and free nations from the yoke of oil dependence. His magnetic television appearances, viral TED Talk and compelling boardroom presence had investors and business leaders worldwide jumping in to ride shotgun. Countries from Japan to Denmark to Australia signed on and the privately-held Better Place raised nearly a billion dollars. Yet in a few years, it was all over --- the company, buffeted by internal strife, an international corporate spy scandal, the Great Recession and technology disruptions, went bankrupt. The story of the "electric car unicorn that collapsed" is a cautionary tale; a timely case study filled with valuable lessons for entrepreneurs, investors and executives in businesses of all sizes --- as well as everyone chasing the electric car Holy Grail. TOTALED lays out the story of what happens when change hits a company on multiple fronts, sometimes all at once. Do you double down and stay the course or pivot like your company's life depends on it? TOTALED plunges deep into the riveting rise and fall of a company that sincerely wanted to change the world but couldn't quite get to the finish line. TOTALED will captivate you, whether you're interested in electric cars and mobility, green energy and the environment; or you simply enjoy reading business biographies. TOTALED has received rave advance reviews from people like David Pogue, the former New York Times tech writer, who says that "Brian Blum's deeply researched account is like playing a car-wreck video in slow motion: You can watch every stroke of bad luck, bad timing, and bad blood reduce a once-thrilling idea to dust." Gina Smith, author of iWoz, the New York Times best-selling biography of Apple co-founder Steve Wozniak, writes that TOTALED grants access to "a side of the startup world that few ever get to see --- much less survive." Ron Adner, author of The Wide Lens: What Successful Innovators See that Others Miss, describes TOTALED as "required reading for ambitious innovators." And Foreword Reviews writes that Better Place CEO Shai Agassi is "as compelling an antihero as found in any technology thriller. The book's as-it-happens narrative makes for riveting reading."